People in racing make mistakes now and again. Engine builders see their engines blow up, mechanics sometimes leave clips attached to the bike when they should be removed, bodywork flies off, bolts fall out, riders miss braking points and commentators call the wrong rider in a mass crash (I certainly know about the latter). But while some take events on the chin with humility, others have the arrogance to never admit a mistake. 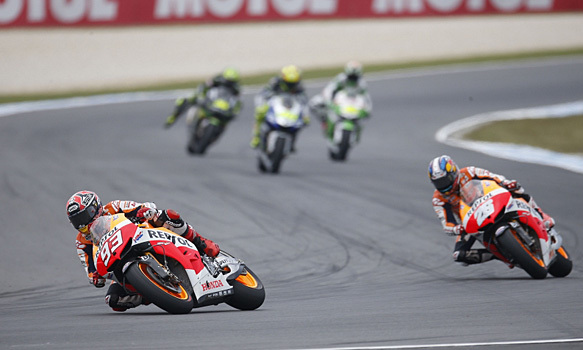 The 2013 Australian MotoGP weekend was an occasion when the tyre companies dropped a massive clanger. 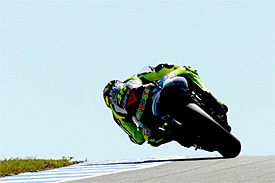 A three-million Australian dollar operation last Christmas gave Phillip Island a new surface that was perfect for racing, devoid of the bumps that Casey Stoner berated in 2011. "It is as smooth as a baby's bum," said Andrew Fox, one of the circuit owners. It was all laid within a 'bump range' of 3mm. But it was soon apparent that through the long and blisteringly fast left handers that end the lap, the tyres were being hammered to their highest temperatures of the year - and then some. It was not just the new grippy asphalt, but also the highest air temperatures experienced at the normally very cold Phillip Island since we returned in 1997. The previous dry race record was 17C while last Sunday was 28. Plus, the 1000cc bikes are carrying 3kg more than last year and are 10kg more than the 2011 bikes, too. The fundamental mistake was that Bridgestone did not analyse the new asphalt by taking an imprint of the surface and then creating an exact copy back at HQ in Japan. That was what it did for the first Silverstone MotoGP event in 2010, and it went a step further for Aragon that year, when Bridgestone took CAD/CAM data from circuit designer Tilke to analyse corner radius, camber, and the rise and fall of the track. Impressive stuff. With this data the engineers could add the weight and speed of the bike into their programme and come up with the required tyre. Both weekends went off without a tyre problem. Barcelona and Jerez were resurfaced in 2005, but free testing was allowed at that time. Mugello was resurfaced in 2011 but Bridgestone had Ducati able to feed back results. I asked a Bridgestone representative on Thursday if the 'Aragon process' had been repeated for the resurfaced Phillip Island. The answer was that they "did not take physical samples of the Tarmac, but talking to the manufacturers and teams from World Superbike we have an idea of what to expect." That was how the weekend went wrong for Bridgestone before the tyres even left Japan. Sending a young engineer on an overnight flight to Melbourne, driving to the track, taking the new asphalt imprints and taking the return night flight would've meant they didn't need to pay for a hotel room. Sure, testing of a tyre with a MotoGP bike would have been ideal, but there is no test team anymore thanks to budget snipping, hence the imprint technology being introduced. So, with a tyre problem apparent on Friday something had to be done. MotoGP Race Direction regularly receives mickey-taking from the press corps, but this time it had to make a decision about whether or not the 2013 Australian MotoGP was going to actually happen. The arguments could take place in Tokyo after the race. In the short term, the priority was just to make sure the event happened and the race was safe. 'Plan A' was a 26-lapper split in two with mandatory pitstops for bike changes. But after the Sunday morning warm-up was held in even warmer conditions than the day before, it was cut to 19 laps with a maximum of 10 on each tyre. Two races of 10 laps each would've messed up TV schedules and as much as many couldn't give a stuff about those, they eventually pay the bills for the teams and the riders. No TV, no sponsors, no sponsors and we all go club racing at Darley Moor. Those who remember Shinya Nakano's 200mph crash at Mugello in 2004 when his (unsafe) tyre blew up were erring on the side of not taking any unnecessary risks. In the race, Marc Marquez missed the two-lap pitstop window and circulated 11 times before coming in. HRC might have a budget of about $65 million, but it appears it simply overthought its strategy and believed coming in after lap 10 would suffice. "In reality this counts as an extra lap," Marquez admitted. "We hadn't had that in mind and this was a huge mistake. We had everything well planned and I followed the instructions on my pit board." When Marquez rejoined the track after 11 laps he made contact with Jorge Lorenzo. This was partly due to Marquez rejoining at the worst possible time. He did look over his shoulder to see if the others were coming, but the replay after the race was from a high boom, so Marquez could have been unsighted due to the crest on the main straight. Besides, Lorenzo was never near the apex and so drifted wide into Marquez. He later admitted he missed his braking point, probably momentarily distracted by Marquez on his left. It was a close one. 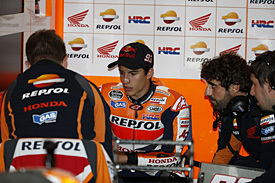 Soon Marquez was black-flagged for doing more than the permitted 10 laps. Pictures of his 11-lap-old rear tyre looked like it had done a 500-mile Dakar stage, rather than 28 miles around Phillip Island. It was shot on the left hand side. 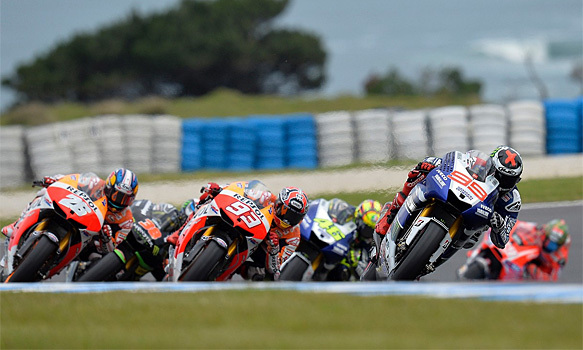 Lorenzo went on to win the race, thus keeping a glimmer of his 2013 championship alive. Some fans loved it because we had more entertainment in one short race while some fans hated it because it wasn't a 'pure' grand prix. All of the 'flag-to-flag' races we have had since the rule was introduced in 2005 haven't been 'pure' but have been hailed by all as exciting or thrilling with a knife-edge atmosphere. In the end MotoGP had a race. The same situation 10 years ago would have left us with no race at all as the non-stop 'flag-to-flag' race format was only introduced at the start of the 2005 season. Before 2005 a race would be stopped and restarted with no concept of timing. For example, the 500cc race at Jerez in 2000 was rain-interrupted. It formed up late (the 250cc race delayed it), was delayed on the grid and thus started even later. It was then stopped at 15.38 local time, restarted nearly an hour later and finished just before 17.00. From the bikes coming out of the pits to getting to the podium that afternoon was a comical process of over two and a half hours. The other option in Australia was to have a two-part race of even shorter length or no race at all. Then people would've complained even more. That might have happened at the start of the MotoGP era and left even more people up in arms. At the track, the small crowd of 31,500 fans may have thrown their stubbies in the direction of the offending asphalt. On Saturday afternoon it looked like we might not have a race at all. In the end we had an Australian Grand Prix during which no crashes happened. That was the over-riding priority. Bridgestone and Dunlop getting a dressing down from Dorna and the FIM is a lesser concern than a cancelled race or injured riders. No riders were unable to start because of the tyre problems. That wasn't the case for Moto2's Thitipong Warokorn. He won't race again this season because he hit a tyre wall without any air fence on it on Saturday. Air fence are readily available and cheaper than tyre companies going testing. Is that what should have been of more concern to the riders and the fans of this sport than the fact that we had a one-off change of format in Australia? What can Porsche's Le Mans comeback achieve?